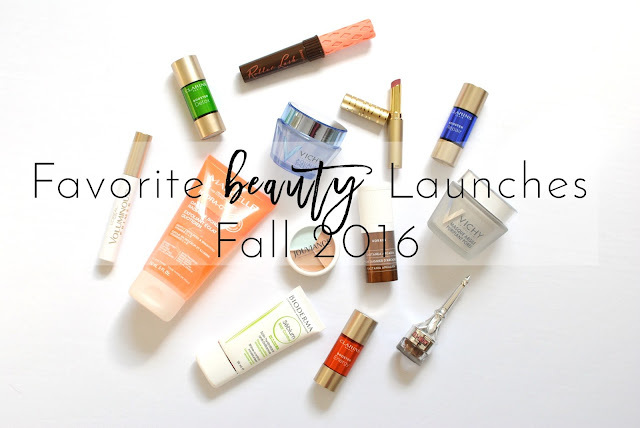 This Fall has given us some pretty exciting new things in the beauty world! I've had a few weeks to test some of them and here are some of my favorite so far. Benefit Roller Lash Brown Mascara and Ka-Brow Brow Cream ✷ who knew brown mascara could be this glam? I love this one for sky high daytime lashes. Ka-Brow is the best new all-in-one brow product this year. I just wish it didn't dry out so fast in the container. The Clarins boosters trio ✷ I talked about them here. Loved them then, love them now. Vichy's new clay mask and Aqualia Thermal moisturizer ✷ I reviewed all 3 masks here and the clay is probably my favorite. The moisturizer is something else, the texture is to die for! Jouviance pro-color Concealer 3 in 1 ✷ I love the texture of this concealer! Super smooth, it almost feels gel-like. It blends well and the green shade is not chalky at all. Much better than some other color-correcting products I've tried. Bioderma Sebium Mat Control Moisturizer ✷ this keeps me matte and doesn't dry out my skin. Enough said. L'Oreal Voluminous Mascara Primer ✷ I've used white mascaras before and was slightly skeptical about this one, but it gives the right amount of extra oomph and volume without making a clumpy mess. Stila Stay All Day Matte'ificent lipstick in Mon Ami ✷ a matte lipstick that stays all day and doesn't dry out my lips? YES. I love that dark mauve shade for the Fall! Marcelle Hydra-C Daily Radiance Scrub ✷ I love a good, gentle, scrub. This one is just that, and does not have any parabens, perfume or oil. Korres Castanea anti-wrinkle Eye Cream ✷ it's been a while since I've liked an eye cream this much! And the packaging is hygienic and perfect to dispense the right amount of product. Do you have any new beauty favorites?